Zhinka dinka doo: Happy boy's day! You can see the finished trout flag on the table above the perch. After painting the fish, we took a pre-hemmed flag and put it face down on the painted fish, then pushed all over to get the imprint. Then just hang up to dry. This activity went well with all the guests except for the almost 2-year-old, who was uninterested in rubber fish. He started twice and left each for his mom to finish. The 3- and 4-year-olds really got into this activity. 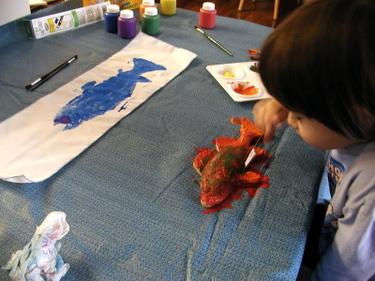 Just enough mess, lots of room for creativity (combining various colors on the fish). Rather than trying to get everyone to gather around a craft all at once, my approach was to pick out one child at a time, whoever seemed most receptive. 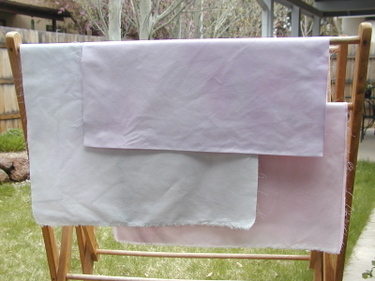 I made the flags out of white cotton fabric that I then dyed using the natural food dyes used for Easter eggs. After making the blue cabbage dye, I've been eagerly soaking various things in it. String, fabric, yarn is next. I also made up a batch of pink beet dye, and the two together make lavender (although mine is more like a different shade of pink, I think it needed more time in the blue). I love the soft shading that I get with this method. After each piece of fabric was dyed and dried, I cut and serged the edges, then sewed a pocket at the top. After the fish was printed on the flag, we inserted cut-to-size straws into the pocket, and threaded ribbon through each for hanging. The straw lets the top of the flag lay straight and not bunch up. Coming soon: pictures of the goodness I received in the mail yesterday! I love this!! What an awesome idea and they came out amazing! We have some gyotaku prints hanging in our house too. I'm going to have to try this with Buddy. Thanks for sharing and Happy belated Boy's Day! I've always wanted to try fish printing; this looks like such a great project! I love the colors and patterns on the kids' fishes (and the subtle dyes of the flags). Our calendar says that May 5 is "Children's Day" rather than "Boys' Day" -- but isn't there a Girls' Day, too? What a fun activity, the koinobori look great! 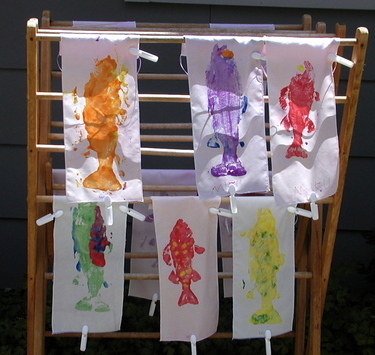 i love your modified gyotaku activity, and the koinobori are wonderful! Amanda these are fantastic. I have similar fish prints done by each of my kids (they used a rubber fish too). This is such a great idea for a kid's birthday party. These are so beautifully done and so simple! Max would like to know if there's a shark version...Perhaps that is not quite in keeping :) You always have such inspirational children's things.